Few sailing magazines fail to include stability data in the form of Gz curves in their new sailboat reviews, as it's probably the most revealing insight into the sailboats' resistance to capsize. At least from static considerations that is; to get a complete understanding of the stability element of seaworthiness, dynamic stability must be taken into account too. Just how does it reveal its secrets? The key to it all is the boat's centre of gravity, it's centre of bouyancy and the distance between them, which changes as the boat heels to the wind. the horizontal distance (Gz) between G and B. The location of G is fixed, unlike B which changes as the boat heels and the immersed section changes shape. As the Centre of Gravity and the Centre of Buoyancy initially move apart and then converge, so the length of Gz - the righting lever - increases and decreases. 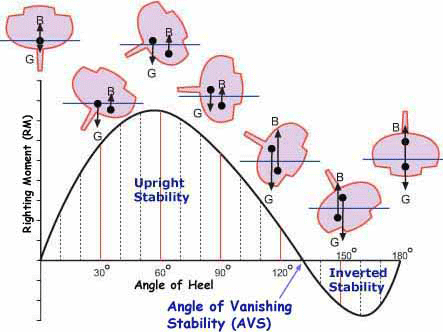 This relationship between heel angle and righting moment governs the shape of the Gz curve and defines the boats static stability. Thankfully it's not necessary to emulate the alarming sequence of events illustrated here to establish Gz curves; these are produced by calculation - these days probably via the designer's hull design software. With the boat upright, G is in the same vertical plane as the Centre of Buoyancy and there's no righting lever. But when the boat heels to the wind, B will move to leeward and a righting lever is generated. As the boat continues to heel, the righting lever will increase to a maximum (in our example at 60° of heel) and then start diminishing until B is once again in the same vertical plane as G. At this point the righting lever is again zero but, unlike when upright, the boat will tend to capsize if its heel angle continues to increase. This point is called the Angle of Vanishing Stability (AVS), also known as the Limit of Positive Stability (LPS), and in our sample Gz Curve occurs at 130°. 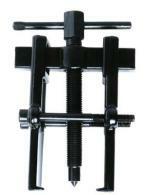 Once heeled past AVS the Gz will become negative and will act as a capsizing lever rather than righting lever. Unless affected by some outside force, the boat will continue to 180° of heel until the CG and CB are in the same vertical plane and the boat is stable again, albeit the wrong way up. It's clear that hull form has a significant effect on stability. When heeling, wide, flat-bottomed hulls move the CB outboard more rapidly than narrower, 'slack bilged' hulls. In general then, the beamier the boat the greater the form stability. At extreme angles of heel, freeboard, deck camber and coachroof design also affect stability. A good height of freeboard will improve both the maximum righting moment and the limit of positive stability. A flush-decked boat or one with a very low profile coachroof will be more stable when inverted than a similar hull with a high, narrow superstructure. A low centre of gravity is always a positive contributor to stability. Normally, the centre of gravity will be on the centreline in a properly trimmed boat, but it can be persuaded to move further from B to give a marked enhancement on the righting lever. Racing skippers achieve this by demanding that under-employed crew sit out to windward. Many an hour have I spent thus as race crew on other people's sailboats, with the toerail cutting off the blood supply to my lower limbs, frozen to the core, and with only the prospect of a beer or two back in the Tamar River Sailing Club preventing my immediate mutiny. In our boat, Alacazam, we can increase the righting moment when it's beneficial to do so by flooding seawater ballast tanks on the windward side. For offshore yachts one of the most apparent and meaningful aspects of the curve is the AVS. However, because the force required to heel a heavy boat is more than that required to heel a lighter one, then clearly the boats mass (or displacement) is also a significant factor. So by multiplying the righting lever by the boat's mass, the righting lever becomes a righting moment (length x mass), and the Gz curve can also be considered as a Righting Moment (RM) curve. As the area under the RM curve represents the energy needed to heel the boat, then a boat of double the displacement will need twice the energy to capsize - and twice the energy to right itself following capsize. All else being equal then, heavy boats are inherently more stable than light ones. It's worth mentioning that the oft-quoted ballast ratio can be misleading when considering stability. This ratio is a measure of the percentage of a boat's displacement taken up by ballast. Although it can give some indication of how stiff or tender a sailboat may be, it takes no account of the location of the ballast or of the hull shape of the boat. 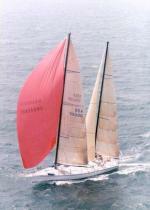 Two sailboats can have the same ballast ratios with very different righting moments. If the hulls are the same, a sailboat with all its ballast in a bulb at the bottom of the keel will be stiffer than a sailboat with a long shoal-draft keel even though they may have the same ballast ratio, and their Gz curves will be quite different. For instance, the bilge keeler below may well have the same ballast ratio as the club racer shown alongside it, but there's little doubt that the club racer will be the stiffer boat.